There are many ways to support EarthShare New Jersey and help protect and preserve the environment. However you choose to contribute, you can make a difference! The purchase of these products or services benefits EarthShare New Jersey and our environment by increasing awareness of important environmental issues, promoting environmentally-friendly habits and by raising revenue for EarthShare New Jersey. TerraCycle– Sign up to recycle your waste through any of TerraCycle’s many free collection programs, and start earning points which can be redeemed for charity donations. Simply add EarthShare NJ to your profile’s charity list help support ESNJ while you’re keeping waste out of the landfill! GoodSearch – Designate EarthShare NJ as your charity of choice, search as usual, and help the environment at the same time. iGive– Visit this link to register and download the donation button for your browser, helping EarthShare NJ when you shop online. If you bank with Investors Bank, you could be supporting EarthShare New Jersey! Simply fill out an enrollment form and link your accounts to EarthShare New Jersey through the Care2Share program. By making this dedication, you’ll automatically donate the equivalent of the average monthly balance of 0.25% of your checking accounts and 0.15% of your savings accounts. Click here to fill out an enrollment form and help us raise funds at your convenience! Have an unneeded, or even unusable, vehicle you’d like to donate to EarthShare New Jersey? If you have the title and keys, remove all personal belongings and license plates, then call 877-999-8322 or go online to schedule a free and efficient pick up! You benefit from a tax deduction, and we benefit from your gracious donation. Visit the V-Dac program for more information! The EarthShare NJ Solar For Good campaign is underway and we are asking all of our supporters to see if solar is right for their homes. With no out-of-pocket expense, going solar is a great way to save money, reduce your impact on the environment, and now it directly benefits EarthShare NJ. 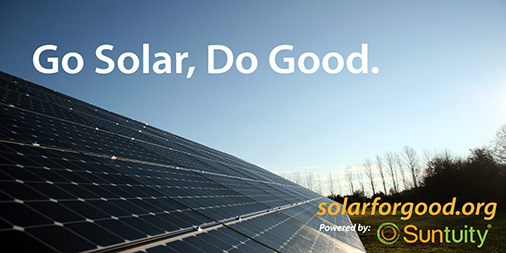 Head over to solarforgood.org/earthsharenj to learn more and support the EarthShare NJ Solar For Good campaign.